The Rotunda of the U.S. Capitol has been considered the most suitable place for the nation to pay final tribute to its most eminent citizens by having their remains lay in state (in the case of government officials and military officers) or in honor (in the case of private citizens). Since 1865, most services have used the catafalque constructed for the coffin of Abraham Lincoln. These occasions are either authorized by a congressional resolution or approved by the congressional leadership, when permission is granted by survivors. When the Architect of the Capitol (AOC) is notified that a ceremony will occur, teams are coordinated across the Capitol campus and a commitment to excellence ensures that no detail is overlooked. Member of the House of Representatives from Texas, January 3, 1967, to January 3, 1971; United States Ambassador to the United Nations, 1971–1973; chairman, Republican National Committee, 1973–1974; chief United States liaison officer, People’s Republic of China, 1974–1976; director, Central Intelligence Agency, 1976–1977; Vice President of the United States from January 20, 1981, to January 20, 1989; President of the United States from January 20, 1989, to January 20, 1993. Died November 30, 2018, in Houston, Texas. Authority for use of the Rotunda granted by Senate Concurrent Resolution 56, 115th Congress, 2d session, agreed to December 3, 2018. Member of the House of Representatives from Arizona, January 3, 1983, to January 3, 1987. U.S. Senator from Arizona, January 3, 1987, to his death. Died August 25, 2018, in Sedona, Arizona. Authority for use of the Rotunda granted by Senate Concurrent Resolution 43, 115th Congress, 2d Session, agreed to August 28, 2018. Minister, evangelist and adviser to presidents. Died February 21, 2018, in Montreat, North Carolina. Authority for use of the Rotunda granted by House Concurrent Resolution 107, 115th Congress, 2d Session, agreed to February 26, 2018. Senator Inouye was the first congressman to represent Hawaii when it became a state in 1959. He served in the U.S. Senate from 1963 until his death on December 17, 2012. Inouye was the second-longest serving senator in history and served as president pro tempore of the U.S. Senate. He was a World War II hero, given the Medal of Honor for his service. Ford was a member of the House of Representatives from Michigan, January 3, 1949 to December 6, 1973, when he resigned to become Vice President. He was Vice President of the United States from December 6, 1973, to August 9, 1974, when President Richard M. Nixon resigned. Ford served as President of the United States from August 9, 1974 to January 20, 1977. He died December 26, 2006, in Rancho Mirage, California, after adjournment of the 109th Congress, 2d session. Authority for use of the Rotunda granted by the Speaker of the House of Representatives and the Majority Leader of the Senate. No resolution. Rosa Parks lying in honor in the U.S. Capitol Rotunda. Parks is best known as a civil rights pioneer. She died on October 24, 2005, in Detroit, Michigan. Authority for use of the Rotunda granted by Senate Concurrent Resolution 61, 109th Congress, 1st Session, agreed to October 29, 2005. Reagan was governor of California from 1967 to 1975 and President of the United States from January 20, 1981 to January 20, 1989. He died June 5, 2004, in Bel Air, California. Authority for use of the Rotunda was granted by Senate Concurrent Resolution 115, 108th Congress, 2nd Session, agreed to June 9, 2004. Chestnut and Gibson were United States Capitol Police officers killed at the U.S. Capitol in the line of duty on July 24, 1998. Authority for use of the Rotunda was granted by House Concurrent Resolution 310, 105th Congress, 2d Session, agreed to July 27, 1998. 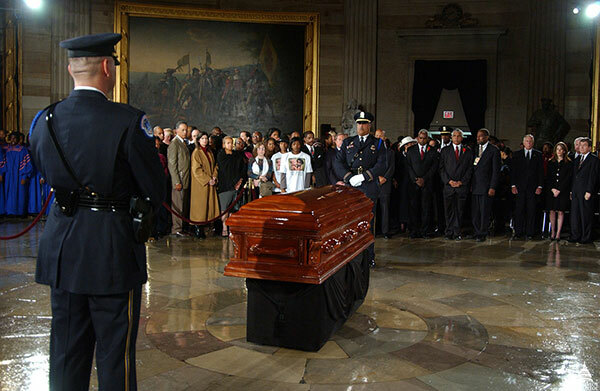 Officer Chestnut and Detective Gibson were the first persons whose remains lay in honor in the Rotunda. Lying in state ceremony for Claude Pepper in the U.S. Capitol Rotunda. Pepper served as U.S. Senator from Florida November 4, 1936 to January 3, 1951. He was a member of the House of Representatives from Florida from January 3, 1963, until his death on May 30, 1989, in Washington, D.C. Authority for use of the Rotunda was granted by House Concurrent Resolution 139, 101st Congress, 1st Session, agreed to May 31, 1989. Chosen to honor the unknown Americans who lost their lives while serving in the Armed Forces of the United States in Southeast Asia during 1959-1972. Authority for use of the Rotunda was granted by House Concurrent Resolution 296, 98th Congress, 2nd Session, agreed to May 17, 1984. Humphrey served as U.S. Senator from Minnesota from January 3, 1949 to December 29, 1964, when he resigned to become Vice President. He was Vice President of the United States from January 20, 1965 to January 20, 1969. Humphrey then returned to the Senate from November 3, 1970, until his death. He died on January 14, 1978, in Waverly, Minnesota, after adjournment of the 95th Congress, 1st Session. Authority for use of the Rotunda was granted by the Speaker of the House of Representatives and the Majority Leader of the Senate. No resolution. Johnson was a member of the House of Representatives from Texas from April 10, 1937 to January 3, 1949. He was a U.S. Senator from Texas from January 3, 1949 to January 3, 1961, when he resigned, having been elected Vice President of the United States. Johnson served as Vice President from January 20, 1961, to November 22, 1963, when he assumed the Presidency. He served as President until January 20, 1969. Johnson died on January 22, 1973, near Johnson City, Texas. Authority for use of the Rotunda was granted by House Concurrent Resolution 90, 93rd Congress, 1st Session, agreed to January 23, 1973. Hoover was the first Director of the Federal Bureau of Investigation, serving from 1924 until his death. He died on May 2, 1972, in Washington, D.C. Authority for use of the Rotunda was granted by House Concurrent Resolution 600, 92nd Congress, 2nd Session, agreed to May 2, 1972. Member of the House of Representatives from Illinois, March 4, 1933 to January 3, 1949. U.S. Senator from Illinois, January 3, 1951, until his death. Died September 7, 1969, in Washington, D.C. Senate Resolution 254, 91st Congress, 1st Session, agreed to September 8, 1969, extended invitations to memorial service in the Rotunda, September 9, 1969. Eisenhower graduated from the U.S. Military Academy at West Point in 1915, was promoted to General of the Army in 1944, and was named President of Columbia University in 1948. He served as President of the United States from January 20, 1953, to January 20, 1961. 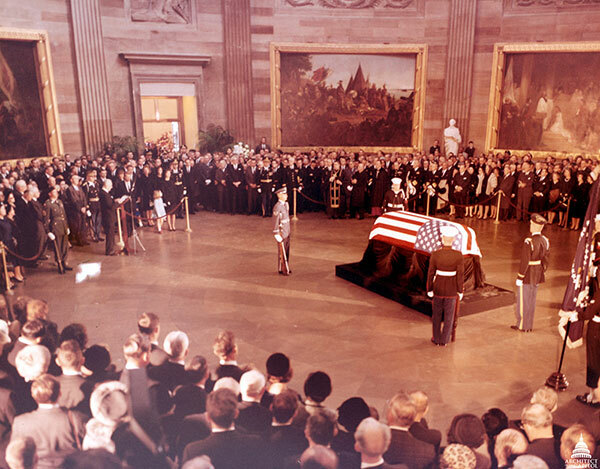 Eisenhower died March 28, 1969, in Washington, D.C., during the 91st Congress, 1st Session. No resolution. Hoover served as Secretary of Commerce for Presidents Warren G. Harding and Calvin Coolidge. He was Food Administrator under President Woodrow Wilson. Hoover also served as Chairman of the Commission on the Organization of Executive Branch of Government in 1947-1949 and 1953-1955. He was President of the United States from March 4, 1929, to March 3, 1933. Hoover died October 20, 1964, in New York City, after adjournment of the 88th Congress, 2nd Session. No resolution. MacArthur was Superintendent of the U.S. Military Academy at West Point from 1919-1922; appointed Chief of Staff of the Army on November 21, 1930; and was appointed General of the Army on December 18, 1944. From July 26, 1941, through April 11, 1951, he served in the Pacific and Far East in various allied commands. MacArthur died April 5, 1964, in Washington, D.C. Authority for use of the Rotunda was granted by Senate Concurrent Resolution 74, 88th Congress, 2nd Session, agreed to April 6, 1964. 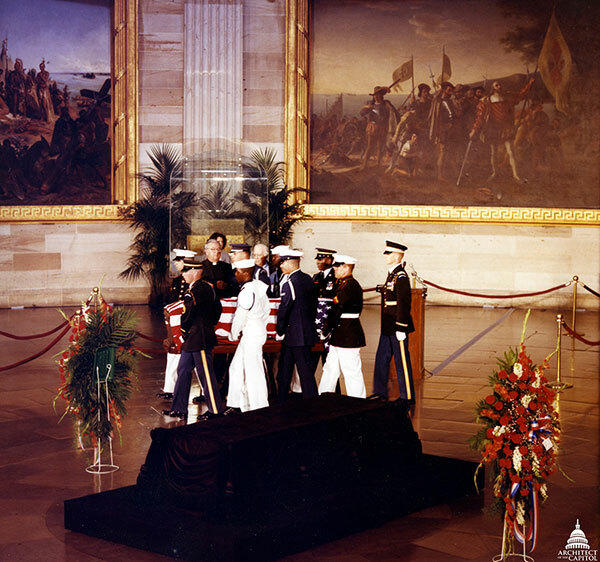 President John F. Kennedy lying in state in the U.S. Capitol Rotunda. Kennedy was a member of the House of Representatives from Massachusetts, January 3, 1947, to January 3, 1953. U.S. Senator from Massachusetts, January 3, 1953, to December 22, 1960, when he resigned to become President. President of the United States from January 20, 1961, until his death. Assassinated in Dallas, Texas, on November 22, 1963, during the 88th Congress, 1st Session. No resolution. Chosen to honor and perpetuate the memory of the heroes who gave their lives while serving overseas in the Armed Forces of the United States during World War II and the Korean War, and whose identities were unknown. Authority for use of the Rotunda was granted by House Concurrent Resolution 242, 85th Congress, 2nd Session, agreed to March 6, 1958. Taft served as U.S. Senator from Ohio, January 3, 1939, until his death. He Died July 31, 1953, in New York City, during 83rd Congress, 1st Session, Senate Resolution 158, 83rd Congress, 1st Session, agreed to August 1, 1953, extended invitation to the memorial service in the Rotunda, August 3, 1953. Pershing was General of the Armies of the United States. He graduated from the U.S. Military Academy at West Point in 1886 and devoted his entire life to military service. He served as Chief of Staff of the Army 1921-24; Commander of American Expeditionary Forces, World War I; distinguished service during the Philippine insurrection and Spanish-American War. Pershing died July 15, 1948, in Washington, D.C., during recess of the 80th Congress, 2nd Session. No resolution. Taft served as President of United States from March 4, 1909 to March 4, 1913. He was Chief Justice of the United States from July 11, 1921 to February 3, 1930. Taft died on March 8, 1930, in Washington, D.C., during 71st Congress, 2nd Session. No resolution. Harding served as U.S. Senator from Ohio, March 4, 1915, to January 13, 1921, when he resigned, having been elected President. He was President of United States March 4, 1921, until his death. Harding died August 2, 1923, in San Francisco, California, after adjournment of the 67th Congress, 4th Session. No resolution. Chosen to honor and perpetuate the memory of the heroes who gave their lives in World War I, the body was that of an unknown American who served as a member of the American Expeditionary Forces in Europe. Congress was in session, 67th Congress, 1st Session. No resolution. Dewey was admiral of the Navy and was a hero of Manila Bay in the Spanish-American War. He died January 16, 1917, in Washington, D.C. Authority for use of the Rotunda was granted by House Concurrent Resolution 68, 64th Congress, 2nd Session, agreed to January 18, 1917. L'Enfant was the planner of the city of Washington, D.C. He died June 14, 1825, and was buried on Digges farm in Prince George's County, Maryland. His remains were brought to the U.S. Capitol on April 28, 1909, to be re-interred at Arlington National Cemetery. Senate Concurrent Resolution 2, 61st Congress, 1st Session granted use of the Rotunda, agreed to March 26, 1909. McKinley was a member of House of Representatives from Ohio, March 4, 1877, to May 27, 1884, and again from March 4, 1885, to March 3, 1891. He served as governor of Ohio from 1892 to 1896 and as President of United States, March 4, 1897, until his death. McKinley was assassinated September 6, 1901, in Buffalo, New York, and died there September 14, 1901, after adjournment of the 56th Congress, 2nd Session. No resolution. Logan was a member of House of Representatives from Illinois, March 4, 1859, to April 2, 1862, when he resigned to enter the Union Army, and again from March 4, 1867, until March 3, 1871. He served as U.S. Senator from Illinois, March 4, 1871, to March 3, 1877, and again from March 4, 1879, to December 26, 1886. Logan died on December 26, 1886, in Washington, D.C., during the 49th Congress, 2nd Session. No resolution. 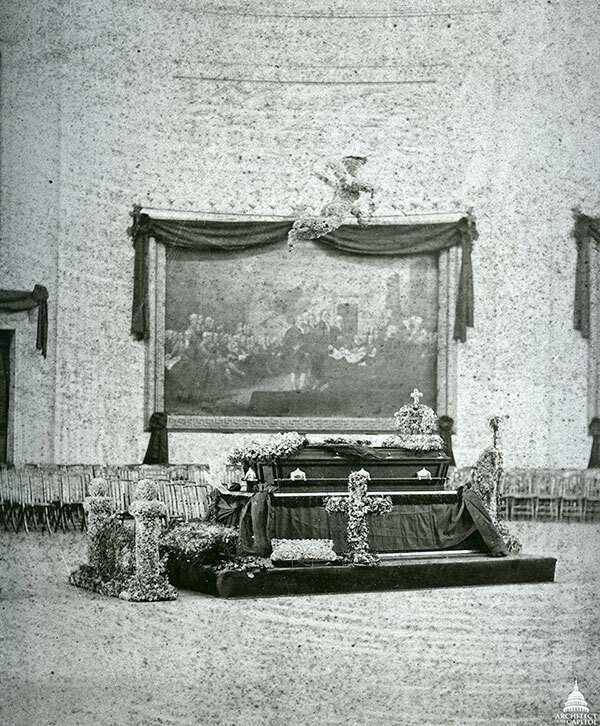 James A. Garfield lying in state in the U.S. Capitol Rotunda. Garfield was a member of House of Representatives from Ohio, March 4, 1863, to November 8, 1880, when he resigned, having been elected President. He served as President of the United States from March 4, 1881, until his death. Garfield was assassinated July 2, 1881, in Washington, D.C., and died September 19, 1881, in Elberon, New Jersey, after adjournment of 46th Congress, 3rd Session. No resolution. Wilson served as a U.S. Senator from Massachusetts, January 31, 1855, to March 3, 1873, when he resigned to become Vice President of the United States. He was Vice President from March 4, 1873, until his death on November 22, 1875. Wilson died in the Vice President's room in the Capitol Building in Washington, D.C., after adjournment of the 43rd Congress, 2nd Session. No resolution. Sumner served as U.S. Senator from Massachusetts, April 24, 1851, until his death, March 11, 1874. He died in Washington, D.C., during the 43rd Congress. No resolution. 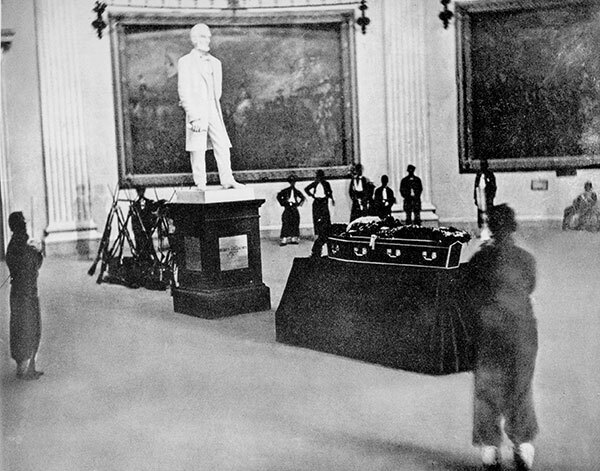 Funeral of Thaddeus Stevens in the U.S. Capitol Rotunda. Stevens was a member of the House of Representatives from Pennsylvania, March 4, 1849, to March 3, 1853, and again from March 4, 1859, until his death on August 11, 1868. He died in Washington, D.C., during recess of the 40th Congress, 2nd Session and lay in state in the Capitol Rotunda. No resolution. Lincoln was a member of the House of Representatives from Illinois, March 4, 1847, to March 3, 1849. He was President of the United States from March 4, 1861, until his death. Lincoln was assassinated April 14, 1865, in Washington, D.C., and died there April 15, 1865 after adjournment of the 38th Congress, 2nd Session. The historic catafalque was constructed to support Lincoln's casket during his lying in state. No resolution. Henry Clay was a member of the House of Representatives for five non- consecutive terms (1811-25). He served as Speaker of the House in 1811-14, 1815-20 and 1823- 25. He was Secretary of State from 1825 to 1829. Clay also served as U.S. Senator from Kentucky intermittently for 18 years between 1806 and 1852. He died June 29, 1852, in Washington, D.C. during the 32nd Congress, 1st Session, becoming the first person honored by a funeral ceremony in the Capitol Rotunda. No resolution.